Just connect to any Windows® PC. LoiLoScope EX software is pre-installed in PICSIO so you can start using it right away, no installation to PC necessary! iFrame is a computer-friendly video format that simplifies and speeds up the process of importing, editing and sharing video. iFrame is based on standards and works with compatible Mac and PC applications. Intel® Core™ 2 Duo, at least 2GHz. *The software for Macintosh is not included. The applicable software is required. LoiLoScope EX has direct menus for upload to YouTube™ or Facebook in just a few simple steps. There are also options for exporting data to your iTunes® library, or outputting for DVD creation. In addition to easy file trimming, you get a variety of special effects like animated decorations, plus image cropping and rotating. Insert an optional Eye-Fi card into the SD card slot and PICSIO is ready for wireless connection. 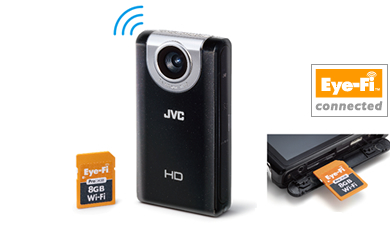 In your home, or café, anywhere Wi-Fi is available, you can upload your videos and stills without using a PC.